Miami kicker Todd Sievers reacts after kicking a field goal to tie the game at the end of the fourth quarter and send the Fiesta Bowl against Ohio State into overtime in Tempe, Arizona, on Jan. 3, 2003. Two days after Thanksgiving, the Miami Hurricanes closed out another mediocre regular season with what the Miami Herald called a “dismal downer” of a game. They never led Pitt in the 35-23 defeat, and many UM faithful streamed out of Sun Life Stadium with almost an entire quarter left to play. Miami will appear in a postseason game this month because it has a just technically bowl-eligible 6-6 record (and it’s a well-known university). But the Duck Commander Independence Bowl in Shreveport, Louisiana, is not exactly a destination befitting a program that was once college football royalty. Cycles of boom and bust, however, are nothing new in Coral Gables. This Saturday, ESPN is airing “The U Part 2,” a “30 for 30” by director Billy Corben that follows up on his 2009 documentary about the Hurricanes’ dominant, lawless football program of the 1980s. The sequel explores the process that rebuilt the scandal-ridden team into what would become, statistically, the most talented — if not quite the most dominant — team in college football history. This is what happens when a program transgresses enough NCAA rules to deserve its own documentary. During the late 1980s and early 1990s, the Hurricanes’ violations ranged from a pay-for-play scandal to a UM academic adviser helping players defraud the federal government of Pell Grant money. When the NCAA was finished handing down its penalties, the Hurricanes had been banned from the postseason for a year and stripped of 31 scholarships from 1995 to 1997. But under Butch Davis, the Hurricanes had figured out how to rebuild. From creative accounting to get around the scholarship limits — Davis persuaded wide receiver Santana Moss (among others) to run track on scholarship for UM while walking onto the football team — to rummaging through the recruiting bin for undervalued prospects, Davis amassed a talent collection better than college football has ever seen before or since. If we judge the players by where they were drafted in the NFL, tally the expected future approximate value for players picked in that slot, add it up for each school by each historical draft class, and assign a weighted sum of the previous four years to each college team-season,3 the Miami teams built by Davis and eventually coached by his successor, Larry Coker, are in a universe unto themselves. 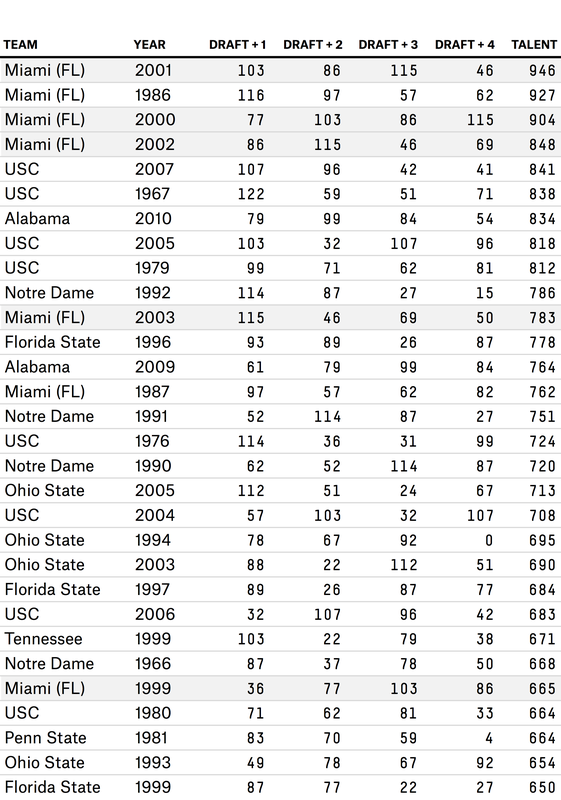 The single most talented college roster of the past 48 years, according to this measure, was the fabled 2001 Miami Hurricanes, who went 12-0 and won the BCS title while posting one of the best point differentials (+395) of any national champion. Davis-built Miami teams in 2000 and 2002 also rank third and fourth, respectively. 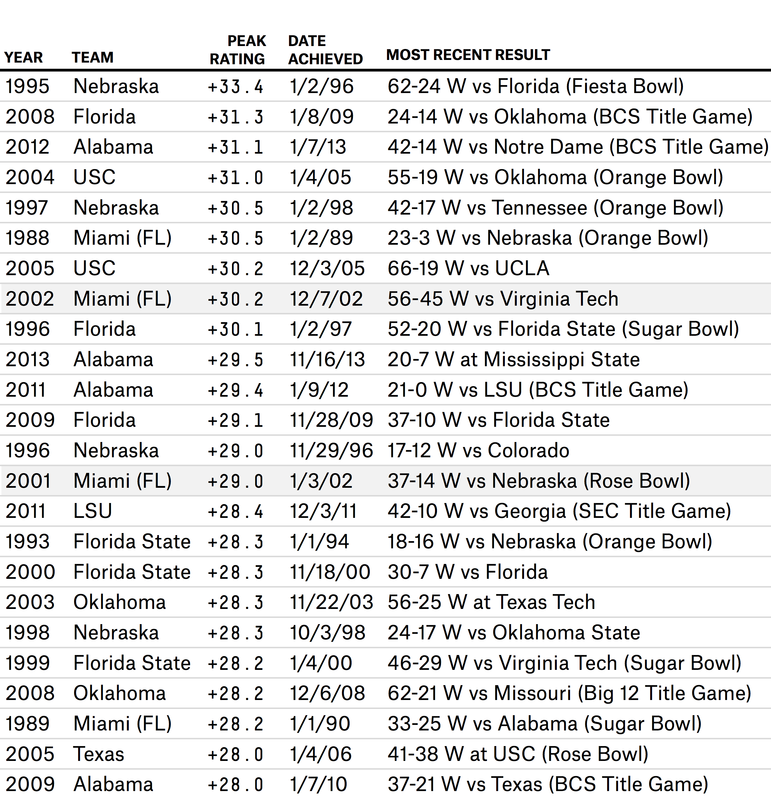 The Hurricanes turned their unprecedented collection of talent into a one-loss 2000 team (which media-poll voters thought should have played undefeated Oklahoma for the national championship instead of Florida State, whom Miami had beaten earlier in the season); a historically dominant, unbeaten national champion in 2001; and a 2002 squad whose sole loss came in double overtime of the BCS title game. It’s probably the closest such a sentiment has ever come to actually being true. Then again, as stacked as the Davis/Coker Hurricanes were in terms of skilled athletes, and as impressive as their 34-game winning streak4 was, it’s difficult to argue they would have torn up the pros when they barely cracked the top 10 in terms of the highest modified FPI ratings by college teams in the past three decades. Under Davis, the Hurricanes’ Elo rating peaked at +24.3 after they beat Florida, the AP Poll’s No. 7, 37-20 in the 2001 Sugar Bowl — Davis’s last game as UM’s coach before leaving for the NFL’s Cleveland Browns. After Coker took the reins, Miami’s rating would grow to +29.0 after thumping Nebraska 37-14 in the 2002 Rose Bowl, and crested at +30.2 before the 2003 Fiesta Bowl against Ohio State. That mark represents the 10th-highest rating achieved by any team since 1982, but it trails entries from some of college football’s other most celebrated dynasties — including the 1990s Nebraska Cornhuskers, the 2000s USC Trojans, the 2008 Florida Gators, the 2012 Alabama Crimson Tide and even the 1988 Miami Hurricanes. There’s also the tricky matter of how the Hurricanes’ second golden era ended, marred by yet another scandal. While the program was ultimately assessed lighter penalties than it had received in the mid-1990s, in some ways that was due as much to the NCAA’s botched investigation as it was an absolution of Miami’s violations. In other words, the team tends to seesaw between greatness and mediocrity. And while life at “The U” has its peaks and valleys, if the story of Corben’s second Miami film is any indication, the next Hurricane dynasty might be just around the corner, no matter how bad things seem in the present. According to an Elo-like modification of ESPN’s Football Power Index (FPI) developed by FiveThirtyEight’s editor in chief, Nate Silver. Although it bears mentioning that, even in a relatively “down” recruiting year like 1996, the Hurricanes still hauled in four of the nation’s 100 best recruits. The weights, in this case, are 4-3-2-1, derived from what combination best predicts a team’s FPI rating for the season in question. So, for instance, Miami players accumulated 103 points of AV in the 2002 draft, 86 points in the 2003 draft, 115 points in the 2004 draft and 46 points in the 2005 draft. That means the weighted sum for the 2001 Hurricanes squad is 4 times 103, plus 3 times 86, plus 2 times 115, plus 46 — which equals 946 points, the highest total any college team posted since the first NFL/AFL common draft in 1967. Which stretched between Sept. 23, 2000, and Jan. 3, 2003. In stats parlance, it has the largest standard deviation — 9.5 Elo points.